Here at Sing Core, we’re proud to be providing the Sing Sandwich to the world thanks to Lowe’s Home Improvement and other retailers like sheet good and lumber suppliers across the USA. It is our sincere desire to see Sing Sandwich in use in all American homes. Sing Sandwich has Sing Core exposed on the edge. This is normal and rudimentary for millworks and the high end developers that we work with day-in and day out. With exposed edges it is not uncommon for the average do it yourselfer to not have knowledge about how to close the edge of the Sing Sandwich, so for those we offer this simple guide to offer ideas of some of the ways the exposed edge can be closed or hidden when necessary for your project. Edge-banding can take on many different forms. The first method, as when working with a standard Sing Sandwich with plywood surface, would be to use a similar strip of wood to match the surface material cut to the thickness of the panel, then gluing the strop to the exposed area and finish the edges to your specifications. You may use a material that does not match the surface as edge-banding materials are readily available in almost any material including nylon, plastic, aluminum and other composite materials. 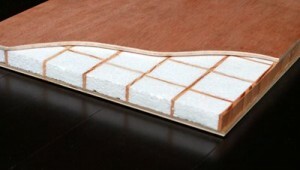 You can use any solid material cut to size for interior blocking to seal the edge of your Sing Sandwich. In most cases, this is a slender piece of wood that can be used not only as an edge but for purposes of connecting hardware or other panels. Simply router out the exposed Sing Core to the depth of your wood, clamp and glue as in traditional wood cabinetmaking. The U channel is an effective manner of closing the edge of a Sing Sandwich and it can be used in three alternative fashions depending on your intended application of your Sing Sandwich. Having three closed sides and one open side, the U Channel could be made of any material, like wood, plastic, aluminum, etc… and it can be bonded into place in any one of these ways. Gluing the U cannel to the exterior of the exposed edge seals the edge nicely. While this is quite common it is the method that leaves a slight lip that may or may not affect the end product. The other U channel methods leave smooth edges without a ridge. Useful in many high tech designs, the embedded U channel with the cavity exposed can be elegant and useful when integrating your Sing Sandwich into your design. Possibilities about with the exposed cavity for running utilities, adding hardware and joining panels. Like the embedded, closed cavity U channel, extruded aluminum tubes in a square format (closed on all four sides) can also be embedded in your Sing Sandwich offering extra reinforcement and connection options. Edges can be mildly routed out to your specifications and filled with any specified materials, like epoxy, to achieve the closed end results that you desire. … And these are only some of the most popular ways of closing the edge of a Sing Sandwich.